It’s 2019 and roofers should not worry too much about local citations besides Google My Business. That doesn’t mean they should not worry at all however. Tools like Whitespark and Yext can help roofers quickly manage their citations throughout the web. The truth however is that in 2019, citations will not heavily influence local rankings. Even in 2018, local citations were only considered to be 10.82% of the Map Pack ranking algorithm and even less than that (8.41%) for organic. We project that number to be even less in 2019. Google My Business optimization, company reviews, and website quality each matter much more. What Is an Online Citation? Though it is one of the simplest components of SEO, listings optimization is still a practice that goes unattended, far too often. At Roofing Webmasters, our goal is to exhaust every last detail, and venture down every possible optimization avenue. Online citations are a great place to start. With optimized online citations, your roofing website will not only rank higher on search engines, but will earn credibility among customers. Our team at Roofing Webmasters claims and optimizes each citation with a clear intention to; make your business more appealing to customers, increase rankings on search engines, and ultimately boost sales conversions. Not only are online citations important to search engines, but they also establish online credibility. Business directories like Angie’s List or Yelp can really increase visibility and convince potential customers that your business and website is trustworthy. 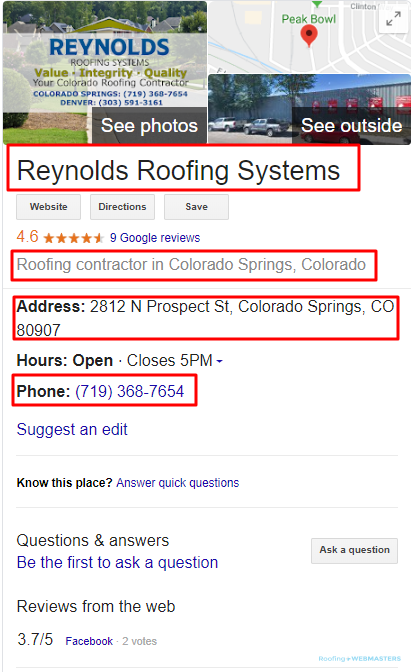 With this in mind, the more citations your roofing website accumulates, the more credible you seem to consumers, and the more likely you will be to receive a higher ranking on local search listings. With citation management from Roofing Webmasters, your company will attract more business, gain more clients, and increase search rankings. There are generally two types of citations, partial citations (name and phone number) and full citations (name, address, and phone number). Some citation sources require more information, and offer additional space to market your company through website links, about me sections, and logo and header photos. When we identified completion as part of our optimization process, we were referring to citations like these. We want to make sure that every representation of your company online is as appealing as possible to consumers. You never know where your next roofing lead is going to come from. National citation sources are important, but creating citations that are specific to your area and industry are even more critical. We build local citations by joining industry and local associations. Roofing companies with a decade or more of service will likely already be members of some of these associations, in which case they should document those accomplishments on their website. In order to rank in local search listings and attract clients, all citations must be accurate and consistent. Our team goes through each citation to ensure uniformity. Upon completion of each listing, we check for duplicates and have them removed if necessary. Roofing Webmasters will not only develop online citations through 3rd party directories, but through your own website, as well. It is important to have the necessary information on your website so customers are able to locate and contact you. Our team has many years of experience creating citation sources that rank higher in search engines and increase visibility to local customers. Online citations aren’t always talked about as an internet marketing tool, but we understand that every SEO component is important, and we will leave no stone unturned. Updated on March 25, 2019 at 8:35 pm by Roofing Webmasters.